The AFP International Conference on Fundraising is held each spring and brings more than 4,000 fundraising professionals together to discuss, teach, and learn about new development issues. It offers more than 150 educational sessions designed to serve the development needs of participants from entry level to highly experienced. The Conference exhibit hall features over 300 vendors. The 2020 conference will be held March 29-31, 2020 in Baltimore, MD. AFP offers one Chamberlain Scholarship to a deserving individual who has not attended a previous AFP International Conference. The Chamberlain Scholar receives conference registration for only a $10 administration fee (at Scholar’s expense) as well as $1,000 to help defray travel and lodging expenses. Congratulations to Luke Comeau, the 2019 Chamberlain Scholar! AFP offers one ICON Chapter Scholarship to a deserving individual who HAS attended a previous AFP International Conference. The ICON Scholarship recipient receives conference registration as well as $1,000 to help defray travel and lodging expenses. The SD AFP Chapter will award up to two scholarships to help defray the cost of members who are taking the CFRE test. The scholarship must be used within a year of notification of receiving the award. It may not be used for renewal of CFRE re-certification. Scholarships will be awarded in the spring and fall. To apply, please submit the CFRE Scholarship Application Form. Deadline for the scholarship applications are Friday, March 29 and Friday, September 13, 2019. Congratulations to Dzenan Berberovic, Spring 2018 & Virginia Wishard Lambert, Fall 2018 CFRE scholarship recipients! 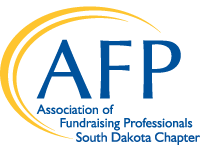 The SD AFP Chapter will award up to two scholarships of $125 each for the South Dakota National Philanthropy Day Conference. Scholar shall be responsible for any costs incurred beyond the award amount. To apply, please submit the NPD Scholarship Application Form. Deadline for the scholarship application is Friday, September 13, 2019. Congratulations to Chad Berg and Mallory Kloucek, 2018 NPD Scholarship recipients! The 2019 Mid-America Conference on Fundraising will be held in Wichita, KS. This conference will feature keynote speakers, breakout sessions, and opportunities for networking. CFRE Continuing Education credits will awarded to attendees. The Mid-America Conference on Fundraising has been offered since 1986, and is the longest running multi-state chapter conference in the United States. For more information about the Mid-America Conference on Fundraising, visit www.afpmidamerica.org. The SD AFP Chapter will award up to two scholarships for the Mid-America Conference on Fundraising. The scholarship will cover the cost of tuition to the conference. Scholar shall be responsible for any costs incurred beyond the award amount. To apply, please submit the MAC Scholarship Application Form. Deadline for the scholarship application is Friday, March 29, 2019. Congratulations to Andrea Serna & Sara Schneider, 2018 MAC Scholarship recipients!